In an ironic, spine-tingling twist of fate, the “real” gates to Pluto’s mythic underworld have been discovered by archeologists on the eve of the novel’s release. 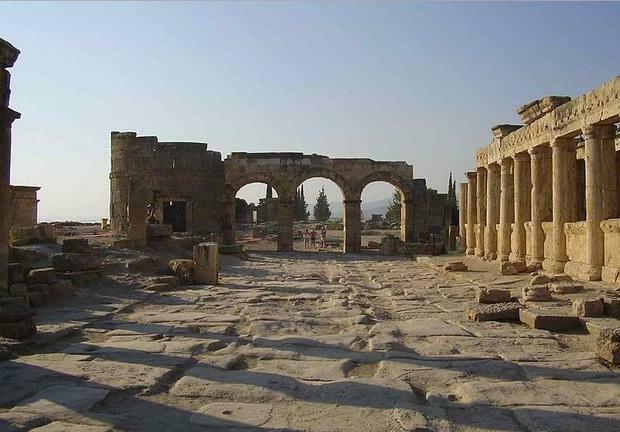 The gates rest in what used to be the ancient city of Hierapolis in Turkey, marked in the Gods’ names: Kore (known also as Demeter) and Pluto. The site rests atop of a volcanic spring whose noxious fumes have killed countless birds and animals. Priests and priestesses would camp near the opening of the cave beneath, transported to an alternate reality by the fumes, to titillate watching crowds of the faithful. It would have been a place for entry into the mysterious, a place to navigate the subterranean currents of consciousness which mark the beginning of all great stories. In Pluto’s Gate (the novel, just now hitting a bookstore near you) the gate is a portal to another dimension, a place both mythic and archetypal, a place where all stories go to be born, to grow. And some will be forgotten, only to be born again.